Стили народов в нашей игре сильно отличаются друг от друга, поэтому для большей гармонии я обобщила их легким намеком на средневековые записи, будто все эти истории в свою книгу собирал седоватый монах-ученый. Для референсов я использую околоэтнические материалы, ещё помогает книга “Signs & Symbols”, в которой рассматриваются значения и происхождения символов и рисунков народов мира. Конечно, за основу саундтрека я беру отсылки к тем культурам, к которым эта музыка будет относиться, хотя не скажу, что я черпаю в них вдохновение. Я не оглядывалась на что-то конкретное, не могу назвать конкретные треки или исполнителей. Музыка для игры просто появилась. Она нарисовалась из ниоткуда. Из моего восприятия этого мира, того как, я его вижу. Да на миллион всего ориентируюсь: Banner Saga показывает как сделать совершенно минималистичный геймплей стильным и захватывающим, Stellaris – крутая штука про космос и “первый контакт”, Age of Decadance – та самая “древняя технология”, да ещё и переворачивающая восприятие игрока, игры от Telltale просто безумно цепляют… Беру идеи отовсюду. И боюсь теперь, что проект выйдет вторичным. Обнуляю переменные, делаю игру. Чего и вам желаю. i never asked for this. Вместо того, чтобы играть в новый Deus Ex я перевожу вот эту претенциозную херню, что эти разработчики про себя удосужились изрыгнуть. Надеюсь, они будут гореть в аду за это. Faction styles in our game are quite different, so In order to add some generalization to the overall stylistics I have decided to add a slight hint of medieval manuscripts, as if all of their stories were carefully collected and put together in a book by an old silver-haired scholar-monk. In my work I use ethnic references and a book called “Signs & Symbols” where origins and meanings of symbols and drawings of different cultures from all over the world are explained. As a basis for my soundtrack I use cues from cultures that specific tracks corresponds to, though I cannot say that I draw my inspiration from them. I do not reference something directly, cannot point at any specific track or an artist. Music for this game is just appeared, happened. It came out of the blue. From my perception of this world, from how I see it. I take a million different things as a reference: Banner Saga shows how to take what is a very minimalistic gameplay and make it stylish and gripping. Stellaris – a cool little game about space and “first contact”. Age Of Decadence – that is where that “ancient technology” came from, and the game itself is completely flips the player’s expectations, and those Telltale games are insanely gripping… I take my ideas from wherever I can. And now I worry that this project will turn out to be an underwhelming experience. Setting variables to zero, making a game. Same to you. I never asked for this. Instead of playing the new Deus Ex game I am having a “time of my life” translating all that pretentious crap those developers belched about themselves. Hope they will burn in hell for that. Мы всегда ждем от древности простоты и наивности, почти всегда забывая о том, что научные достижения тех времен стоят в основе технологической пирамиды, вершина которой являет наш текущий уровень развития. Вот взять, к примеру, колесо – одно из шести простейших механизмов – уже шесть тысяч лет назад где-то в польше на глиняные горшки наносили рисунки запряженных в колесные телеги быков. С тех пор колесо распространилось буквально повсеместно. Способствовало развитию гончарного дела, появлению астролябии и других научных приборов, изобретению зубчатой передачи в механике. И до наших дней оно дошло со многими улучшениями, но совершенно без изменения принципа работы. When thinking about something ancient we always tend to expect simplicity, naivety even, but we often forget that the scientific achievements of the days gone form the base of the technological pyramid, while the tip of said pyramid represents our current development level. Lets take a wheel as an example – one of the six of the most basic devices – six thousand years ago, somewhere in Poland pictures of wheeled carts drawn by oxes decorated sides of clay pots. The wheel has since reached almost every corner of the world. It has contributed to the evolution of pottery, invention of astrolabe and other scientific apparatuses, as well as to the discovery of a cogwheel. Surely, a modern wheel is quite different from the one we had a long time ago, but the basic principles of its operation are largely the same. And with all due respect to the wheel and its friends from humanity’s basic technologies, we have decided to imagine an opposite situation: what if our ancestors were much more advanced than we are now? 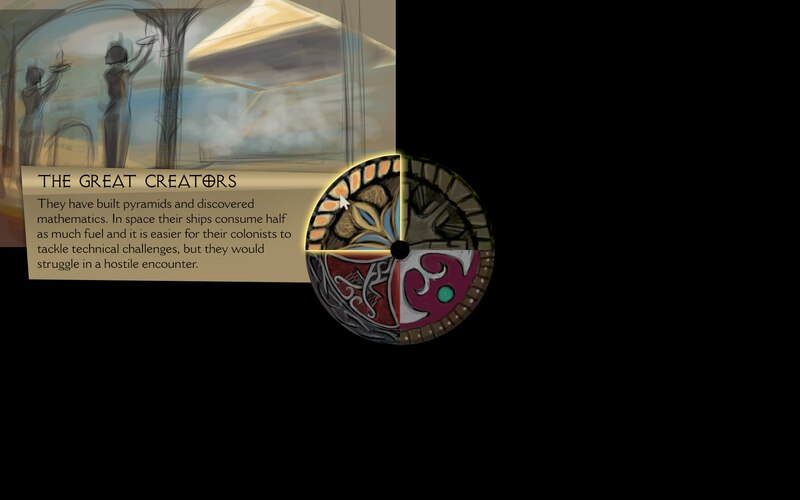 So we have given a task to the civilizations of old, the same daunting task that fills the minds of countless people throughout the globe now – a colonization of the first planet, finding a new home, exploring Terra Incognita, and now we will see how ancients will perform that task. Considering their mentality (and style, of course!). Dear colleagues! Do you like surprises? We have something to show you. How about some cookies with a secret ingredient? Game is done. It’s cute, fun and relaxing. And cats. Fluffy cookies. Or how are we going to call our project? Hello everyone! I want to show you something. Our development goes pretty good and after final approval of the game’s backgrounds our artist found out that she has a couple of unused sketches left, you can find them in the attachment below. Our game is about a meeting between a necromancer and an alchemist, by the way. What’s gonna happen? You’ll know as soon as game is finished. For now though, look at these beautiful sketches!